The Safco Serenity™ mid back big and tall leather office chair provides a luxurious seating experience in any working environment. 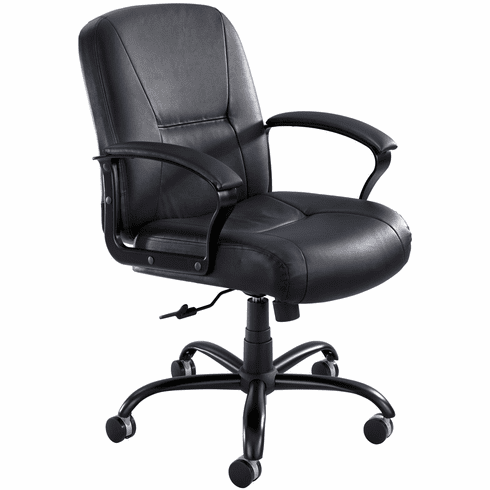 This executive leather desk chair is especially designed for the big and tall person, with a weight capacity of 500 lbs. Although the Safco Serenity Mid Back Big and Tall Chair is designed for larger and taller individuals and has a weight capacity of 500 pounds, it also provides a roomy seat for smaller people. With a five star oversized base, swivel seat and a black finish, this gorgeous chair is the perfect solution of your home office. Rated up to 500 lbs. Capacity - Weight: 500 lbs. Seat Height: 19 1?2" to 22 1?2"